Sydney MC Dialectrix has consistently been revered as one of Australia’s premier lyricists. He is arguably the most technically skilled MC in the country, with his effortless delivery, flow, cadence and rhyme structures. 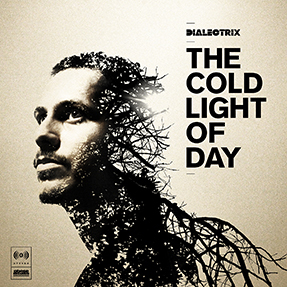 On his third album The Cold Light Of Day, D-Trix teams up with producer Plutonic Lab for the whole album.The album has been totted by Obese Records CEO Pegz as, “The hip hop version of Dark Side Of The Moon.” The album contains various sounds and styles, much due to Plutonic Lab’s unconventional production style. The album’s designed to be a concept record, one that touches on themes including depression, isolation, parental responsibility, capitalism and alcoholism. Having Plutonic Lab on board helps with creating a plethora of different sounds and textures, while at the same time sounding very purposeful and intentional. The album needs to be heard from start to finish as the musicality of the production is important to be heard in its intended context. Plutonic Lab’s background in instrumental hip hop is very reminiscent with his work on this recording, with many of his beats sounding very progressive, expansive and spacious, often ignoring the conventions of typical hip hop production. Much of his beats are produced with vibrant synths, creating a sense of anticipation and intrigue. Being a drummer with Muph N Plutonic, this also impacts Plutonic Lab’s beats as it gives them a very percussive sound, particularly on the opening track Shadow In The Light which contains a very syncopated drum pattern. Generally speaking, the album is not particularly radio-friendly, with the majority of the tracks opting for a emphasis on the productions and the technical nature of the lyrics. There are some notable exceptions though including first single New Generation. This track is relatively simplistic compared to the rest of the album, which worlds very well as a first single. D-Trix’s flow coupled with the horns and the chorus’s catchy hook make for a very appealing first single. The other example of this is Take Flight, a laid-back feel-good track a very hypnotic keyboard loop. Momo from Diafrix lends his vocals to the chorus providing a very smooth and soulful melody. D-Trix often raps over very mellow, jazz-inspired beats which is more evidence of the diversity Plutonic Lab has to offer as producer. Tracks like the albums’ title track The Cold Light Of Day and Black & Gold display very subtle and mellow production, not unlike what you might find on a DJ Shadow album. The aforementioned track is highly jazz-influenced, which helps D-Trix express his lyrical content, which is poetic, introspective, self-critical and refreshingly honest. Fire In The Blood is another extremely personal and honest track as D-Trix express fears surrounding a child’s upbringing. That’s the biggest difference between this and previous Dialectrix releases. While D-Trix has always been a brilliant MC, his two albums prior this were more about wordplay and multi-syllabic rhyme patterns, this album is about the depth behind the words. There’s a content and cohesion both musically and lyrically on here that was absent on previous album. Much of the album’s appeal comes gradually, with different aspects grabbing the listener’s attention on different listen. It’s an album that needs to be heard several times before forming a full opinion of, but it’s intricacies and fluency make it a brilliant album.